Apple are reportedly “looking into” viral footage of a smoking iPhone 7 Plus… and Samsung users are smug AF. 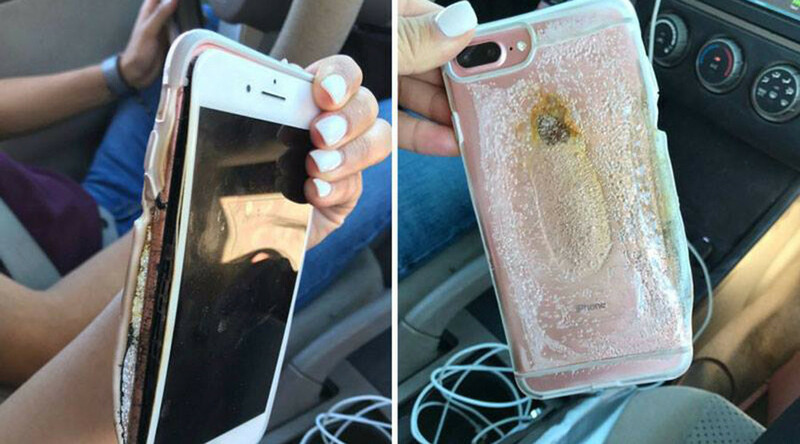 On Thursday, 18-year-old Brianna Olivas shared a video of her rose gold iPhone emitting a stream of smoke after it had apparently exploded, and with almost 30,000 retweets, it caught Apple’s attention. Olivas told Gizmodo that the phone, which she bought in January, wouldn’t turn on the day before it exploded, but a Sprint employee told her everything seemed fine after running a diagnostics test. The phone was working normally then until the following morning when it was unplugged from an Apple charger, placed on a dresser, and began steaming and making a squealing noise. Olivas said her boyfriend threw the phone into the bathroom where it immediately blew up and started emitting even more smoke. Apple replaced the Arizona native’s phone immediately and is “in touch with the customer and looking into it,” according to a spokesperson. While the incident is miniscule in comparison to the international storm that surrounded Samsung’s faulty Galaxy Note 7s, it hasn’t stopped smug Android users from relishing the turnaround. Last August a Sydney cyclist suffered severe burns when his iPhone exploded on his leg following a minor bike accident. In unrelated news the iconic Nokia 3310 is set to make an epic comeback.